The mission statement for this Salon states ’The aim of the London Salon is to exhibit only that class of photographic work in which there is distinct evidence of artistic feeling and execution.’ So, as Lisa says “it suits my style of photography.” But no one was more surprised than Lisa when the email came through to tell of her award and acceptances! Lisa has had a good season in the club competitions with placed images in nature and mono, two firsts in open print and creative. 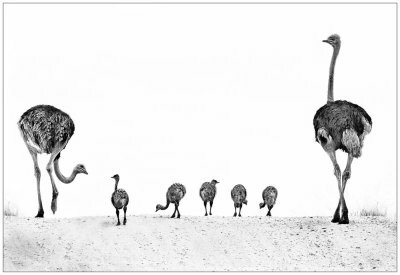 This encouraged her to enter the Western Counties Photographic Federation exhibition where she achieved success with two gold medals, and another ostrich image, ‘Ostrich Family Outing’, went on to receive the Best in Show Award. She has had further successes with this image, receiving gold medals in the Southampton International Salon and the South Devon Salon of International Photography. Further afield she had three print acceptances in the respected Edinburgh International Exhibition of Photography. Describing her work is somewhat difficult; sometimes labelled fine art, creative or even photo-art. Lisa describes it as ‘a more creative version of the original, maybe playing with tones and colours’ to recreate what she remembers seeing or feeling. Occasionally she might use PhotoShop to remove ‘clutter’ to simplify and highlight the subject, as with her ‘Ostrich Family Outing’ image. Lisa credits the Dorchester Camera Club and particularly the distinctions group sessions, held once a month, with the constructive critiques and practical technical advice, to enable her to move on from her original ‘snaps’ as she calls them! The Club is very proud of Lisa’s achievements and congratulates her on this special year. It has many other excellent photographers who cover a huge range of genres between them and who have achievements to be proud of.